A few months ago, I wrote a post about running uCLinux on Cortex M3/M4. Since then I’ve had the opportunity to play a with Cortex M3 & M4 boards capable of running Linux, as last week, I received Emcraft Systems Freescale K70 Starter Kit together with their MicroSemi (previously known as Actel) Smartfusion SoM. Today, I’ll show some pictures of the baseboard and modules I received in the kit, and some details about the documentation and how to get started with the modules. Here’s the baseboard with Ethernet, USB interface using USB-UART bridge connected to the UART0, JTAG connectors (P3 and P5), two push-buttons and a breadboard for easy access to unused signals (ADC, I2C, SPI, UART and GPIOs). P4 and P6 are the sockets to plug in the SoM. There is a lithium-ion battery (CR2016) at the back of the board for the RTC clock. As previously mentioned, I’ve received 2 SoMs, but I’ve just taken pictures of Freescale K70 system on module, as both are similar. 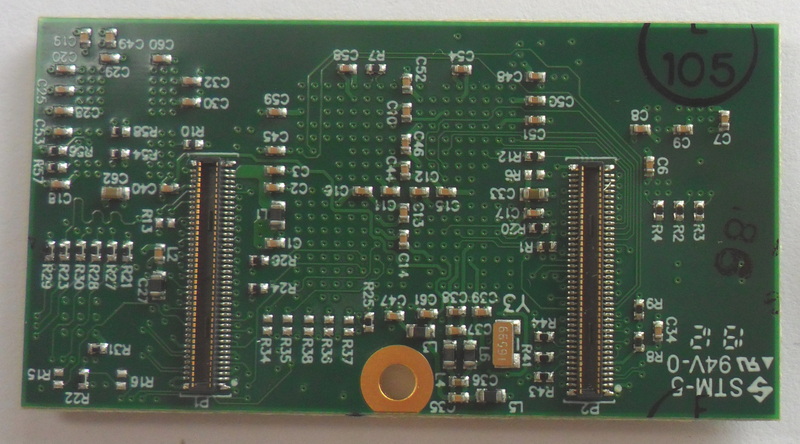 The tiny module comes with Freescale K70 Cortex M4 MCU (PK70FN1M0VMJ12), 64 MB LPDRAM and 128 MB NAND Flash. 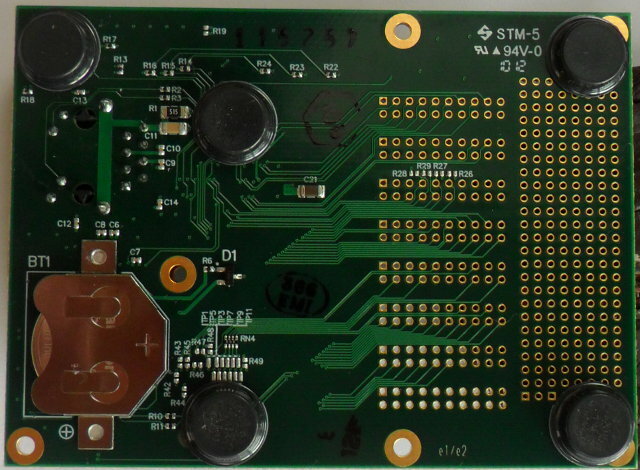 There are no active components on the back of the module, just capacitors, resistors, a crystal oscillator and P1/P2 connectors to interface with the baseboard. MicroSemi Smartfusion SoM comes with with MicroSemi Cortex M3 MCU (A2F500M3G), 16 MB PSRAM and 8 MBytes NOR Flash. The starter kit also ships with a mini USB to USB serial cable that is used to power the board and debug via the serial interface. There is no documentation provided with the package, because once you buy a starter kit, you’ll be able to download the BSP and documentation on Emcraft website. Emcraft Systems provides lots of good documentation. However, the first time, it’s a little confusing because you don’t really know where to start. A README file or Quick Start Guide to explain what each file is for, and possibly a picture with the description of he baseboard would have be useful. 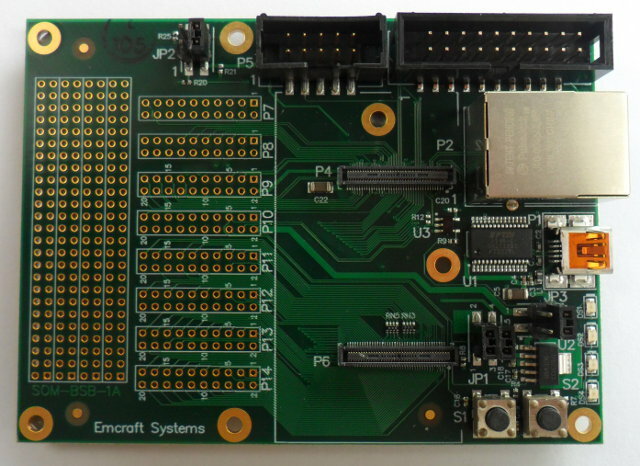 The files contain documentation and software for several hardware platforms, as Emcraft does not only support their own modules, but also other boards such as Freescale TWR-K70F120M board and Hoermann-IMG SmartFusion embedded board. Connect the mini USB to USB cable to the target board and your computer. Wait until the driver installation to complete for the first time. A new COM port should show up. (In my case COM9 in Windows XP). The boot is very fast and you can have access to the command line in less than 2 seconds. Here are the MCU details. But this is not a problem since you can also build your own with extra commands if needed. That leaves plenty of memory for running the application. I suppose power consumption can be reduced by different methods such as adjusting the clock speed, but I haven’t studied this into details. It should be expect that the MicroSemi SoM consumes less than Freescale K70, as the latter runs at 120 MHz vs 100 MHz for the former. That’s all you need to configure your build machine. This will download your newly built image via TFTP and start it. If you are interested in these development boards, you can buy them on Emcraft Systems online store. Kinetis K70 System-On-Module Starter Kit is available for 99 USD and SmartFusion System-On-Module Starter Kit for 126 USD. Regular prices are respectively 159 and 176 USD, but the kits are discounted until the end of June. You need to ask for a discount coupon to a2f-linux-support at emcraft.com. It’s also possible to buy the modules separately without the baseboard. The modules are available in quantities (500 units) for 69 USD (Microsemi SmartFusion SoM) and 49 USD (Freescale Kinetis K70 SoM) per piece.